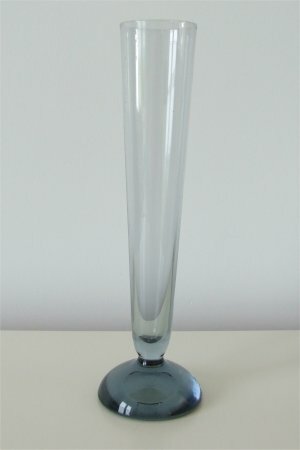 This grey vase is approximately 182mm (7 & 3/16ths") tall. 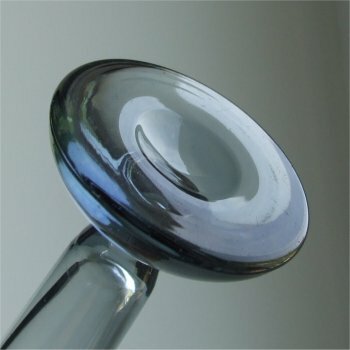 The base is half a ball shape, with no bubbles. The stem is the same colour as the base and has a wide flare being 36mm (approximately 1 & 3/8ths in diameter.) The bottom of the base has a circular, polished, ground out pontil. It does not have a label. Designed by Andries Copier, and in the famous Leerdam grey. It is not documented. However there are three sizes, the larger ones were often used as trophies for boating contests and several found are inscribed with dates between 1948-65.